HANS KRÁSA (1899-1944): String Quartet, Op. 2, ALEXANDER TANSMAN (1897-1986): Triptyque, ERNST KRENEK (1900-1991): String Quartet No. 5, Op. 65. Description: Krasa’s early 1921 quartet is varied in moods, colors, tempi and rhythms, difficult at first approach but its sense of burlesque and irony is of a piece with the time in which it was created. Krenek’s long, 44-minute work from 1930 comes from his very short neo-Romantic period, appropriating a Schubertian aesthetic here with emotionally warm music with a wide range of moods and serves to announce the end of the composer's tonal period. Tansman's Triptyque from the same year is a three-movement work characterized by a nervous rhythmic energy in its outer movements and a calm slow one. 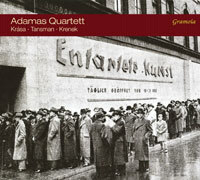 Adamas Quartet.